Watermelon bacterial rind necrosis sounds like an awful disease you could spot on a melon from a mile away, but no such luck. Bacterial rind necrosis disease usually is visible only when you cut open the melon. What is watermelon rind necrosis? What causes watermelon rind necrosis? 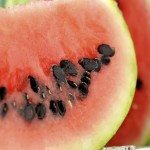 If you’d like more information about watermelon bacterial rind necrosis, this article will help. What is Watermelon Rind Necrosis? Watermelon bacterial rind necrosis is a disease that causes discolored areas in the rind of the melon. The first watermelon rind necrosis symptoms are hard, discolored rind areas. Over time, they grow and form extensive dead-cell areas on the rind. These usually do not touch the melon flesh. What Causes Watermelon Rind Necrosis? Experts believe that watermelon rind necrosis symptoms are caused by bacteria. They think that the bacteria is naturally present in the watermelon. For reasons they do not understand, the bacteria causes symptom development. Plant pathologists have identified different bacteria from necrotic areas in the rind. That’s why the disease is often referred to as bacterial rind necrosis. However, no bacteria has been identified as the one that causes the problems. Currently, scientists conjecture that the normal watermelon bacteria is affected by a stressful environmental condition. This, they speculate, triggers a hypersensitive response in the fruit rind. At that point, bacteria living there die, causing nearby cells to die. However, no scientists have verified this in experiments. The evidence that they have found suggests that water stress may be involved. Since the necrosis does not cause watermelon rind necrosis symptoms on the outside of the melons, it is usually the consumer or home growers who discover the problem. They cut into the melon and find the disease present. The disease has been reported in Florida, Georgia, Texas, North Carolina and Hawaii. It has not become a severe annual problem and shows up only sporadically. Since it is difficult to identify fruits that have been infected by watermelon bacterial rind necrosis before cutting into them, the crop cannot be culled. Even a few diseased melons can cause an entire crop to be taken off the market. Unfortunately, no control measures exist. Read more articles about Watermelons.